"What are you offering me that is better than what I currently believe?" I'm already a faithful Latter-day Saint. Therefore I've got all I need. What makes you think I need more? You're not the church. You're not the "brethren." You're not the prophet. You have no authority. If I'm missing something the church will provide it. I follow the prophet. He knows the way. Perhaps you don't. If what you say is true, I would have heard about it. Frankly, these are all fair questions, and they deserve answers. To keep it simple, I'm going to start with a basic concept we all think we understand, and build from there. If you've been a Mormon for any length of time, you can probably rattle off a lesson about faith, and maybe even a couple of scriptures. So can I. But I want to take a look from a different angle. In Hebrews 11:6, we read that without faith it is impossible to please God. Why is that? I mean, seriously, I can do a lot of good things in this world, help a lot of people, and be an all around nice guy, while still being faithless, or even atheist. Doesn't all that good stuff matter? Doesn't it please God? Well, no, it doesn't. Not in any eternal sense. And here's why. His work and his glory is to bring to pass the immortality and eternal life of man (Moses 1:39). Everything points to that mission, and anything outside that mission is just fluff. He's not pleased if you're not saved. He doesn't want to lose you. It's that simple. So the important question is HOW to develop faith in Christ, unto life and salvation. Fortunately, the prophet Joseph Smith made sure we were not left in the dark in this important matter. In fact, he went to great lengths to ensure we were properly instructed in this vital information by providing exactly what we need in the form of the Lectures on Faith. If you're not familiar with this document, it started as the curriculum of the School of the Prophets in Kirtland. 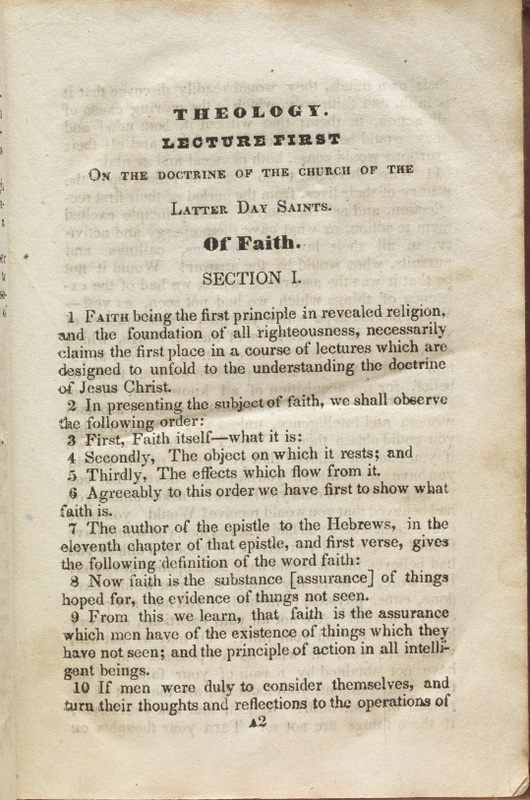 Then Joseph Smith spent quite a bit of time editing it and preparing it for publication in the first edition of the Doctrine and Covenants in 1835, where it took up the first 74 pages of that book. In fact, that book was divided into two halves: the Doctrine part was the Lectures on Faith. The Covenants part was the rest of the revelations. The book was formally accepted by the church as scripture, voted on, canonized, and vouched for personally by Joseph Smith. The Lectures on Faith are holy scripture. Period. So why isn't it in your scriptures now? Well that's a discussion for another day. Joseph Smith said it was scripture, and said it contained "the leading items of the religion which we have professed to believe." Let's go with that for now, and look at what it has to say. 4 Secondly, A correct idea of his character, perfections and attributes. 5 Thirdly, An actual knowledge that the course of life which he is pursuing, is according to his will. For without an acquaintance with these three important facts, the faith of every rational being must be imperfect and unproductive; but with this understanding, it can become perfect and fruitful, abounding in righteousness unto the praise and glory of God the Father, and the Lord Jesus Christ. Let's focus on number 2 for a moment. Joseph italicized the word correct, emphasizing the fact that if we believe information about God that is false, incorrect, incomplete, or wrong in any way, we do not, indeed CANNOT have faith, and therefore cannot be saved. Did you get that? Faith in something that is incorrect IS NOT FAITH. We all believe things about God. But if what we believe is incorrect in any way, we don't have faith. Oh, we may think we do, we will certainly tell each other we do, but in the end, such "faith," built on a sandy foundation, will ultimately turn out to be "imperfect and unproductive." God actually does expect us to invest some effort into learning correct information from correct sources about his character, perfections and attributes. We're damned if we don't. So back to the original question: "What are you offering me that is better than what I currently believe?" As Latter-day Saints, a surprising amount of what we believe is the result of tradition, culture, and assumption, rather than revelation. We are largely unfamiliar with what the scriptures actually say, though we are quick to teach what we think they say. Through it all, we place our eternal confidence upon, and hope in, the religion we espouse, secure in the thought that we can't possibly have any of it wrong. Yet, our doctrine, the doctrine we claim will save us, has changed in massive, fundamental ways since the days of Joseph Smith. Our understanding has receded, and our light has steadily dimmed since 1844 when Joseph died. We're to the point now that we actually deny, conceal, and disavow what Joseph taught was fundamental. Like the Lectures on Faith, for instance. I'm writing this blog to offer some truths about God that we MUST know to receive salvation. I want to help all who will listen to recognize things we think are true but are actually preventing us from exercising faith. I would never expect or want you to place your trust in me as a source of truth, so I'll teach it all from the scriptures and ask you to go to God for confirmation by the power of the Holy Ghost (Moroni 10:5). Important, even world-changing things are happening right now. If you don't have correct information, and therefore can't exercise faith, you will certainly be unable to recognize what God is doing in the world right now, and what he wants you to do. Now, I know you likely think you already know what you need to know. I don't blame you; that's what I thought as well. So in my next post, we'll talk about how you can tell if your faith is the kind that will save you. Also, I don't blame anyone who knows me for doubting I have anything to offer. If you know me, you know my imperfections and problems. So I'll simply ask you to ignore the messenger and focus on the message. That's what matters anyway. I'm not writing this because I want to. This isn't about me at all. It's about seeking truth, and thereby gaining saving faith in God. If we can manage to do that, we please him. That's what matters.